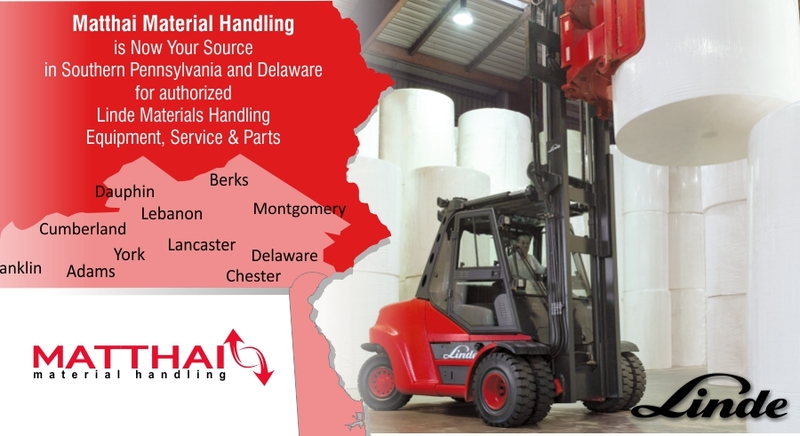 Matthai Material Handling has been an authorized Linde dealership in Baltimore for over twenty years and is proud to announce that we are now your choice for high-quality Linde forklifts, authorized service and parts in Southern Pennsylvania and Delaware! This additional territory comes as a result of our commitment and success with Linde Material Handling Equipment, services and parts. "We are very pleased with the announcement and proud to represent such a quality, world-class brand of products in our entire market. We appreciate the confidence that Linde has placed in all of our associates to represent the Linde brand and look forward to a great deal of success for both of our companies." Randy Matthai, President, Matthai Material Handling. Matthai Material Handling is one of the most successful Linde dealers in the US. Like Linde forklifts, Matthai focuses on providing high-quality products and services that reduce overall ownership costs and improve productivity. Linde forklifts are simply the best built forklifts and provide the lowest total ownership costs of any brand forklift on the market today. Their forklifts are built to perform, as is Matthai's customer service. To inquire about service and parts for your current Linde forklifts from an authorized dealership, please contact us at 410-344-1801. If you haven't been introduced to the world's most durable and reliable forklift, click here to learn more.